Demand for classical and fine Chinese paintings was relatively strong at Sotheby’s Hong Kong Asia Sales last week, despite signs of softening demand for Asian and Chinese contemporary art amid recent financial market volatility. Sotheby’s biannual sales are considered a bellwether of the Asian and Chinese art market with Hong Kong now rivalling London and New York as a global art auction hub, propelled by waves of affluent Chinese and regional buyers. “What we can see is that in spite of the volatility in the stock market, there is still very strong demand for quality works” according to Patti Wong from Sotheby’s. Whilst the Asian contemporary sales in HK saw around a fifth of works unsold, the fine Chinese paintings sale only saw around 5% of lots failing to find buyers, in an auction hall dominated by mainland Chinese buyers. One HK buyer thought he would find a bargain because the downturn in the local stock market, but it did not quite work. Chinese art is resilient and people looking for alternative investments see this an opportunity to buy quality art by Chinese dealers and art investment syndicates snapping up major works by older and blue chip artists. No artist records were reached but the whole weeks art sale reached USD 410 million. 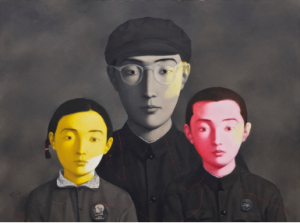 Zhang Xiaogangs painting above, Bloodline family no 1, was sold for 8.9 million USD.